They were, by definition built to last, and many of them did. 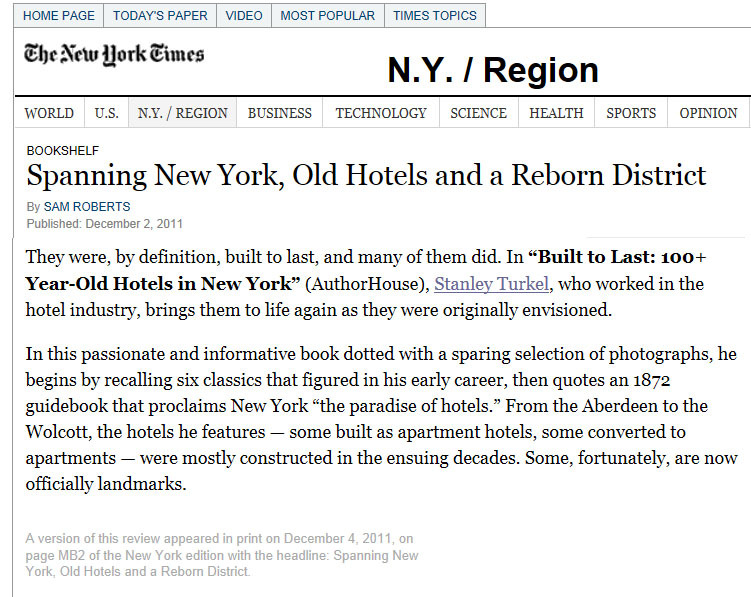 In "Built To Last: 100+ Year-Old Hotels in New York" (AuthorHouse), Stanley Turkel, who work(s) in the hotel industry, brings them to life again as they were originally envisioned. In this passionate and informative book, dotted with (antique postcards), he begins by recalling six classics that figured in his early career, then quotes an 1872 guidebook that proclaims New York "the paradise of hotels". From the Aberdeen to the Wolcott, the hotels he features- some built as apartment houses, some converted to apartments- were mostly constructed in the ensuing decades. Some, fortunately are now officially landmarks.